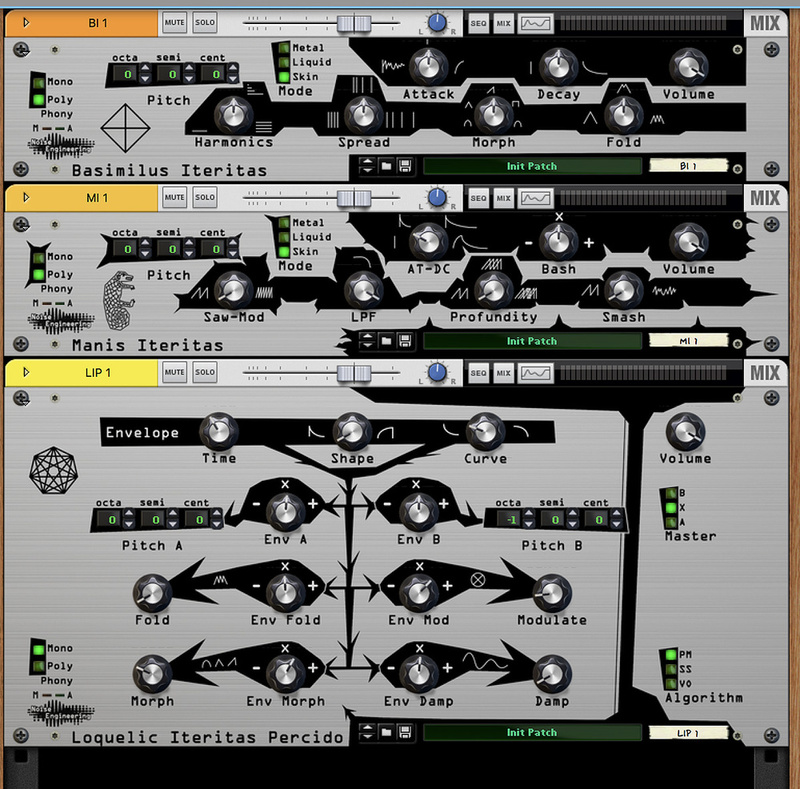 Screen 1: The new Rack Extensions are identical to the original hardware modules, apart from their re-oriented panels and polyphonic mode. Noise Engineering’s modules have made the leap from Eurorack to Reason rack. I think we’ve all come to a point where we appreciate the complementary benefits of hardware and software instruments. Working with hardware can put you into a different creative flow, with a more immersive and exploratory character. Software has the benefits of portability, scalability, recall and ease of capture and arrangement. As hardware and software have become less mutually competitive, a number of instruments are migrating between platforms. 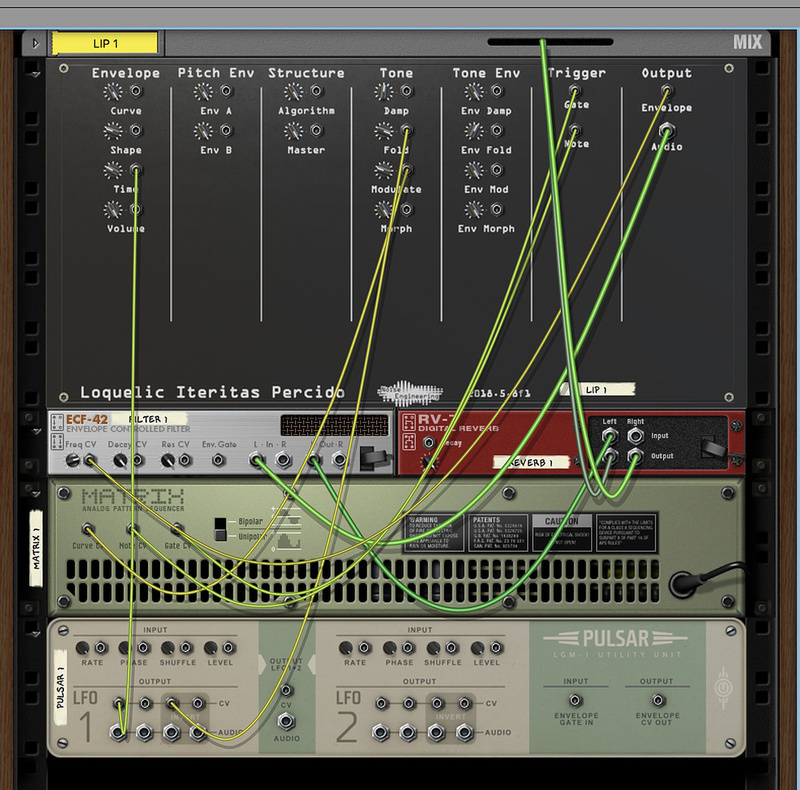 We’ve seen Doepfer and Intellijel modules in Softube’s Modular, Mutable Instruments in VCV Rack (which can now bridge into your DAW via VST); and Europa has busted out of the Reason Rack and become an independent VST plug-in. Our focus this month is on three new Rack Extensions that are software incarnations of Eurorack modules from Noise Engineering (Screen 1). The Propellerheads crew were previewing these at Superbooth and they were incredibly attention-grabbing: it genuinely sounded like there was a Eurorack rig running alongside Reason on their booth. It helped that all the modules are capable of some pretty extreme sounds! Noise Engineering’s VCO modules are perfect candidates for the move to Reason. They’re digital for a start, so the core sound engines are essentially ports rather than emulations. They are also unusually self-contained for Eurorack modules, with their own envelope generators and VCAs. They also collect all their CV, trigger and audio connections in one zone on the modules, rather than right next to the controls. This abstraction makes it less of an issue that in Reason all the connections are confined to the back instead of on the control panel. The panels have been adapted from Euro-standard vertical strips to the landscape aspect of Reason modules, and I actually think the interfaces have been improved and clarified in the process. All the modules have strange pseudo-Latin names; they’re opaque to me (and Google Translate) but perhaps there are in-jokes in there for classical students. Let’s start with Basimilus Iteritas, my favourite of the three modules. This is loosely billed as a drum and percussion module, but is certainly more versatile than that. Basimilus’ sound generation uses six linked oscillators to produce simple but malleable additive or FM synthesis. The VCO generates a root frequency plus five harmonics, which you can adjust in level and frequency spread. That’s not quite the whole story, though, as there are three different synth modes that significantly alter the sound. The default ‘Liquid’ mode uses additive synthesis with a fast pitch envelope, making it ideal for aggressive analogue kicks. ‘Skin’ is similar but without the envelope, so is great for a range of percussive tones and also general synth sounds. 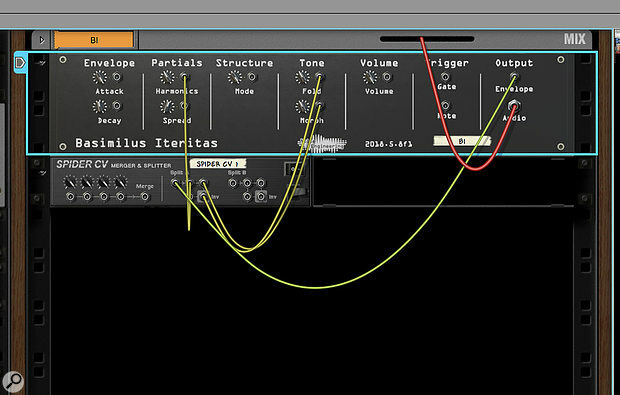 ‘Metal’ is an FM algorithm that can make dense and unusual tones or even rich detuned stacks. The base waveform for all the synth models can be morphed between sine, triangle, saw and square, and back to sine. Screen 2: Internal patching of the envelope output with the help of a Spider CV Multi. The envelope controls are unusual. The attack knob produces an instant attack anywhere up to the 12 o’clock position, but also mixes in a noise signal when turned to the left of this. The decay has quite a big range, with an exponential curve. Sound shaping and distortion are provided courtesy of a wave folder. This can wind up an already dense sound to 11, with industrial noise results that brought Atari Teenage Riot to mind. But there are plenty more subtle shades to be found from the Basimilus Iteritas. Of course this wouldn’t be a Eurorack module without patching options, and the Rack Extension version of Basimilus (like the other new modules) has the same CV connectivity as the original hardware module. Every parameter has a CV input, with the added upgrade of Reason’s standard attenuators on every port. The only CV output comes from the envelope, which can of course be patched back into other places on the module (see Screen 2, above). Other than a main output, there’s no audio connectivity on this or any of the other Noise Engineering modules. Perhaps NE could do some mini-modules to open up the signal processing to the wider Rack. Manis Iteritas is like a custom version of the Basimilus, with quite a lot of architectural changes that make it slightly easier to use, and even more prone to grit and aggression. Noise Engineering describe it as “suitable for leads, bass lines, drums, darkness, detuned madness, or pure mayhem”. The basic synth modes are similar but not the same, and everything is set to sawtooth or something close. Gone are the harmonic controls, replaced with some different processes called Saw-Mod and Profundity. Saw-Mod is a type of oscillator mode that produces PWM-like effects at lower settings, rising to sync sounds when cranked up. Profundity creates a unison effect with extra detuned oscillators, then introduces increasing wandering pitch instability at higher settings. Manis also adds a low-pass filter to the voice chain, and replaces the wave folder with an even more intense distortion that is apparently a “modulus-function wave destroyer”. The envelope is now controlled by a single pot, which increases the decay throughout its travel, plus adds a small amount of attack towards the clockwise end. Coupled with this is the Bash control, a bipolar depth control that applies the envelope to the LPF, Profundity and Smash functions. The third module is a different beast entirely. 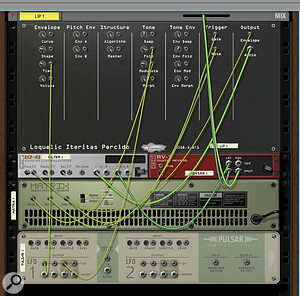 This Rack Extension is listed as a ‘dual digital VCO’, although the original hardware’s tagline of ‘complex digital voice’ describes it better both in terms of sound and concept. LIP has three different fundamental synthesis methods on offer, all of which share a common architecture, albeit with some parameters doing slightly different things within the three algorithms. The basic idea is that you have two independently controlled oscillators which interact in different ways. Either can be the sync master, or they can both run free (set from the Master control). There are then a series of controls which alter the oscillators’ behaviour or determine how they interact. Every parameter is paired with another knob that regulates how much it gets modulated by the single master envelope generator. Turned to the right these apply the envelope as you’d expect. To the left they apply an inverted version of the envelope, but still in a positive direction. I won’t pretend to understand how the three synthesis processes work. It seems like this module was a place where Stephen and Kris at Noise Engineering could play with some experimental synth concepts. The manual credits the originators of these methods, and includes academic references and equations. The first synth type is the most familiar: PM or Phase Modulation. Next is SS, which stands for Summation Synthesis. Finally you have VO, or VOSIM. It wouldn’t really do any of them justice for me to try to categorise them in terms of sound here. Of the four main modulatable processes, two are fairly straightforward. Mod phase modulates Osc A with Osc B, and Fold sets the waveform folding amount. The other parameters vary in their operation depending on the synth mode. Morph changes the waveform shape of one or both oscillators. Damp does very different things from one algorithm to the next, all of which impact the source sound character. The concept of this RE is to provide a very wide sonic palette and it certainly does that. With all the devices I liked to use Reason’s Reset Device function to set everything to minimum, then fiddle with the controls from there. It pays to experiment with subtle changes to find sweet spots where the controls interact nicely. Alternatively you can just go nuts and quickly get some far-out and abrasive results. 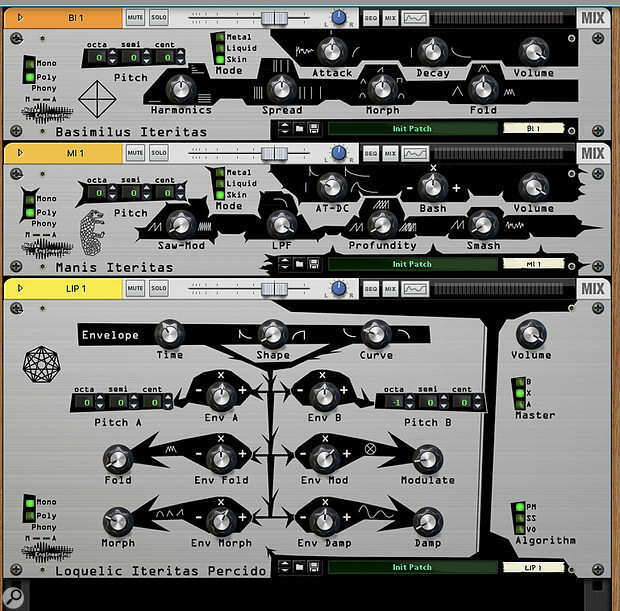 Screen 3: A more complex patch, with triggers and modulation coming from a Matrix Sequencer and Pulsar LFO, and audio routed through a filter and reverb. The filter is borrowing the LIP module’s own envelope generator.Although these new REs are self-contained as far as Eurorack goes, they are still designed with the assumption that they will be combined with other modules, hence the comprehensive CV connectivity. The modules all have a single envelope generator on board, but no LFOs. The LIP module particularly benefits from the addition of some LFO input. There are plenty of available sources you could use. Screen 3 shows a fairly simple example of what’s possible. I’m using a Matrix sequencer to play an LIP module, and also using its Curve facility to modulate the Mod parameter. A Pulsar LFO is also modulating the envelope time and Fold amount. On the audio side I’ve also routed the output of the LIP through an ECF-42 Filter module, and used the LIP’s own envelope to shape it. One thing to note is that Noise Engineering have not limited themselves to mono. This is wonderful but does change the game a bit when creating modular-style patches like the one above. This patch only really works if you switch the module into mono mode, as the external filter is not part of the LIP’s internal per-voice signal chain. The PropShop has quite a few basic modular components that would combine nicely with these new Rack monsters, and one of these days I’ll do a round-up of them here. And hopefully we’ll start to see some more well-loved Eurorack modules (I’m talking to you, Mutable Instruments) appear in RE form.